The demand for cold production is currently rising, so that it is essential to start using technologies that could produce this commodity from renewable or waste sources. Cold production by absorption units uses waste heat from production or non-production processes as its source of energy, thereby considerably reducing electricity consumption compared to conventional cold production. The Thermax units proposed and offered by us offer an absorption refrigeration technology from 35kW to 12,000kW of cold, the source being heat produced from hot water, steam, oil, gas combustion, exhaust gases or fuel gas. Absorption is a chemical process involving the process of dissolution or absorption of a gaseous compound in a liquid (an absorbent). Using this knowledge, it is possible to produce cold by means of technology. Absorption systems use heat energy to produce a cooling effect. 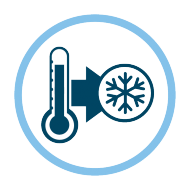 For cold production, it is therefore possible to use unusable (waste) heat as the source of energy. In these systems, the refrigerant (water) absorbs heat at a lower temperature and lower pressure during evaporation and releases heat at a higher temperature and higher pressure during condensation. The absorbent (in this case a LiBr solution) absorbs the refrigerant vapors in the low-pressure part of the system and after heating it releases them in the high-pressure part of the system. For the purpose of heating and subsequent separation of the absorber from the refrigerant, waste heat (for example, from processes) is used. The released refrigerant vapors enter the condenser and they condense there. The partially cooled liquid refrigerant is then released back into the evaporator space (low pressure part of the system) under high pressure. By changing the pressures there is a significant change in the temperature of the liquid refrigerant, which by subsequent evaporation in the evaporator cools the cooled water, which may be used to cool the selected space. By passing the refrigerant temperature to the cooling water, the whole cycle gets to its beginning. 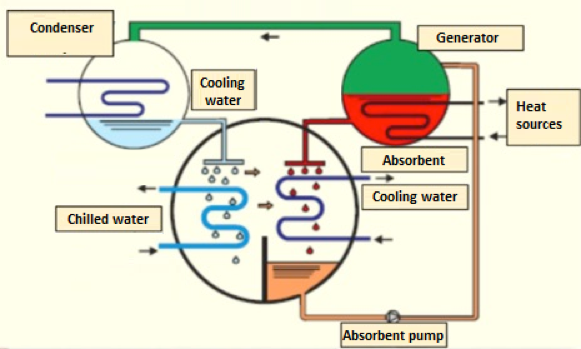 In the ProChill (twin design) absorption machine, the hot water first flows through a high-pressure generator and then flows through a low-pressure generator, which increases the efficiency of the cycle. A disadvantage is the higher purchase price of the entire unit, but its payback period is approximately four years. The Thermax units designed and offered by us offer an absorption refrigeration technology from 35 kW to 12,000 kW of cold with a high COP of up to 1.8. Thermax cooling units may be driven by hot water, steam, gas, oil, exhaust gases or flue gases. The Thermax coolers are tailor-made for the manufacturing process with the accredited certificates ISO 9001, ISO 14001 and ISO 18001. The Thermax absorption coolers have all global certificates and before installation all units are tested for nominal power output of operation directly in the Thermax production plant. Industrial plants, production plants, chemical plants, cement plants, foundries, iron and steel works, … with the possibility of processing waste heat from hot water, steam, gas, oil or flue gas. Production of energy from renewable sources, heat plants, compressor stations, cogeneration, biogas turbines, geothermal and solar heat sources … with the possibility of processing waste heat from hot water, steam, gas. Cooperatives, dairies… with the possibility of processing waste heat from hot water, steam, gas. Wellness centers, water parks, shopping centers, … with the possibility of processing waste heat from hot water or steam. Low operating costs, simple and safe technology. Absorption cooling is an ecological and economical way to produce cold from waste heat.